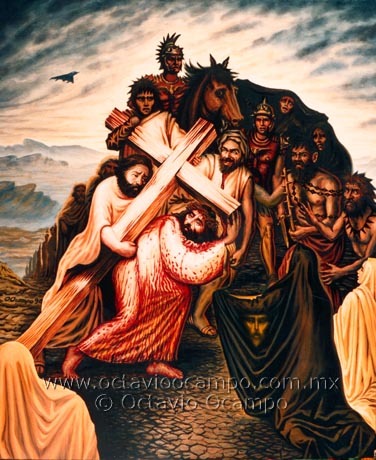 This remarkable piece by artist Octavio Ocampo illustrates Jesus carrying the cross with Roman soldiers and other figures in the background. The most incredible aspect of this picture is that the combination of all the elements together creates the overall form of Christ's face. It brings a whole new meaning to the term 'Jesus Illusion'. 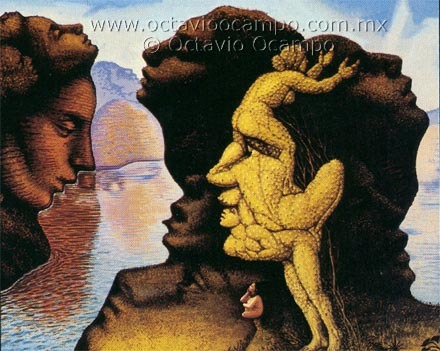 Artist Octavio Ocampo created this piece of artwork of scenery comprised entirely out of face profiles. Can you work out how many different faces there are in this picture overall ? Keep a close eye on the cliffs and the way the water, hills and foreground are seperated. 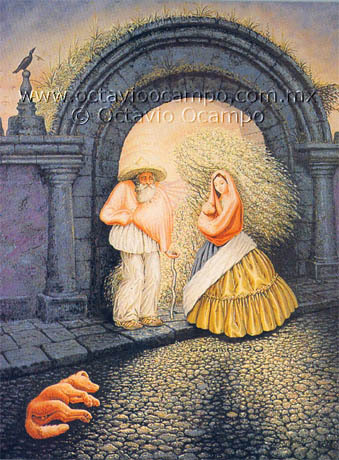 This amazing piece of illusion artwork from artist Octavio Ocampo is called "Forever Always" in English. The main subjects of the picture are an old couple gazing across at one another, however if you look closely you'll see that their faces are made up of several other images including two Mexicans, a large vase and a young woman emerging from an archway on the right. This is a brilliant example of artwork that incorporates optical illusions.